A valuable addition to any domestic system, a Magnetic Filter can dramatically increase the lifespan of your central heating system, giving you the most efficient heating option. A Magnetic Filter is effectively a magnet in a jar, that, when inserted into your pipework, can collect iron particles from the internal sludge that collects and allow for a clearer flow. Every system will have contaminants flowing through it, thanks in part to radiator oxidisation, and so it is important to install equipment that can collect and hold these particles, to avoid build-up that can lead to inefficient heating. 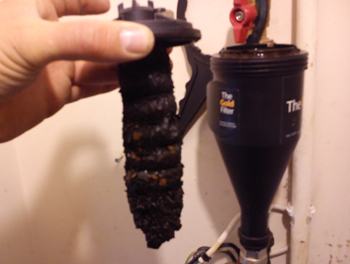 The great thing about a Magnetic Filter is that it prevents this build up, but can only be at its most effective when combined with a Powerflush clean of the system and the introduction of a quality inhibitor. As we covered in our previous post, do you need a Powerflush?, the iron oxide slush that develops inside your system leads to ineffective heating and with it a huge increase in energy use and bill prices. For radiators and water to be heated effectively there is a required flow rate that, when blocked, can’t be reached and so rooms take longer to heat. Once a Powerflush has been performed the next logical step is a Magnetic Filter, to prevent the build up from returning. After your clean your installer will add an inhibitor to your system too. As the name suggests this can vastly reduce your corrosion build up, with the filter gathering what’s left. Together the Powerflush, filter and inhibitor are the holy trinity of ferrous oxide and scale prevention. For an experienced engineer it is a simple installation process that means long term protection for your central heating. At Valcore we specialise in the Fernox TF1 Compact filter, developed primarily for installation in domestic systems. The fact that it is roughly a third of the size of the average Magnetic Filter means it fits comfortably into restricted spaces where others would struggle. Despite its size its performance is equal to its larger competitors, boasting all of the required specifications, including collection of both magnetic and non-magnetic particles, without the additional storage space. A Magnetic Filter can be installed independently if you wish, though this is not something we would recommend. It requires a detailed knowledge of your system, from flow direction and orientation to appropriate chemical water treatments subsequently, but is achievable in some circumstances. So to fully reenergise your central heating system the answer is threefold. Begin with a dedicated Powerflush from a reputable local provider. Once completed add a Magnetic Filter to your system, to prevent future build up. Lastly make sure to take advantage of entry into the system by investing in a quality inhibitor, to keep contaminant build up to a minimum. Separately each can be effective, but together your protection is maximised.